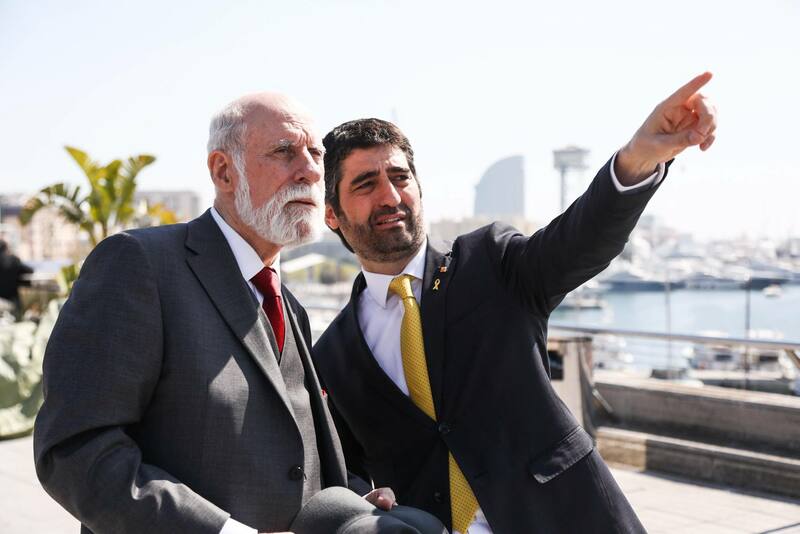 The Minister for Digital Policy, Jordi Puigneró, met today with Vinton Cerf, hours before Cerf was presented with the Catalonia International Prize. 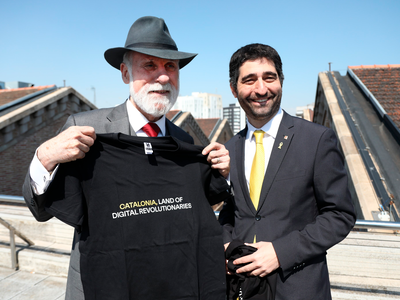 At the meeting, the minister gave Cerf a T-shirt bearing the slogan of a government campaign launched at this year’s edition of the Mobile World Congress: “Catalonia, Land of Digital Revolutionaries”. The minister said he was pleased that for the first time the jury had chosen a technologist and one of the fathers of the internet. “Today, Catalonia is recognising the first digital revolutionary in history,” Puigneró said. According to Puigneró, they discussed where the digital revolution is going and what the critical advanced digital technologies will be in the coming years (including 5G, blockchain, artificial intelligence, big data and supercomputing). “All these technologies will change us and are changing our world – society, industry and services – and they’re bound to change the way we understand the governance of democracy,” said the minister. The minister stressed the Catalan government’s commitment to recognising the impact of technology through the award of prizes and accolades. In 2018, the Creu de Sant Jordi (Catalonia’s highest civil distinction) was awarded to Fundació Punt.CAT, the private not-for-profit organisation that owns the .cat domain. And now the jury for the Catalonia International Prize has decided to recognise the first technologist and one of the fathers of the internet.